To whom it may concern. 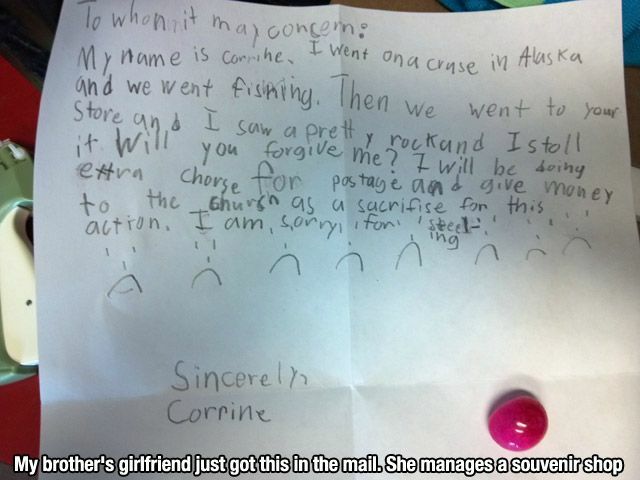 May name is Corrine. I went on a cruse in Alaska and we went fishing. Then we went to your store and I saw a pretty rock and I stoll it. Will you forgive me? I will be doing extra chors for postage and give money to the church as a sacrifise for this action. I am sorry for steeling. Sincerely, Corrine. Nice, And what was her answer?